I have this flair about fruit shakes that every time I eat in a restaurant I always want to taste their version of my favorite fruit shakes. I love natural fruit shakes because you can taste the real flavors of the fruits and it's also healthy compared to other powdered milk shake. Though I'm also a fan of those powdered shake with black sago I just buy them at least once or twice a month for some health reasons. 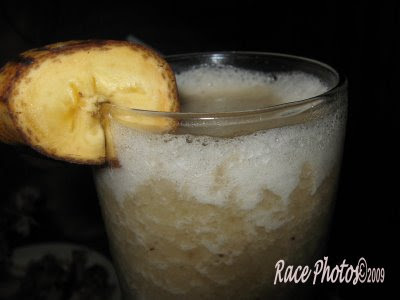 This banana milk shake I have for my entry today is part of the combo meal of Outback Steak House in Libis. The meal for four consists of baby back ribs, beef burger steak, green salad and fettucini. I didn't remembered the restaurant names for the mentioned foods I just described it by myself lol! From the pic above you'll have an idea how yummy it is! Happy Food Friday to all, see other yummy foods here! looks yummy race! next time mango shake naman tapos email mo sa akin isang glass ha *grins*. It looks creamy too! I love that with lots of crushed ice. that looks real good! i like trying out different shakes, too; that is, until i tried cheese shake (lol) and i stopped for a while. hahaha.